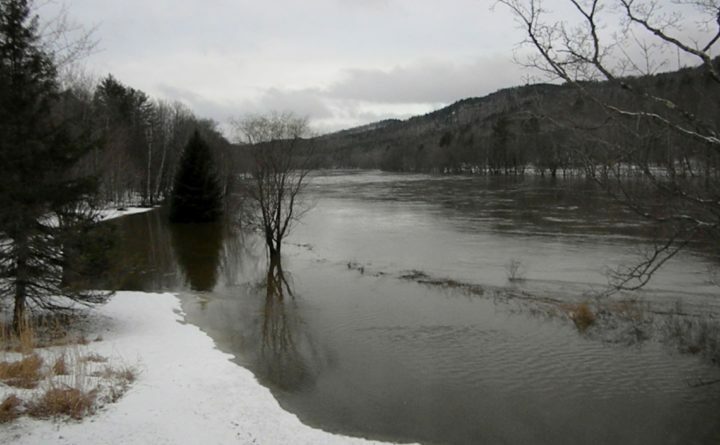 The Androscoggin River in Rumford seen in this BDN file photo. A teenage boy was rescued from the river Tuesday evening after he got stuck on a spinning ice floe. A teenage boy fishing on the Androscoggin River was rescued Tuesday evening after he got stuck on a spinning ice floe. Firefighters rushed to the river about 4:56 p.m. after workers at the ND Paper Mill in Rumford spotted the teen and another boy near the river’s edge and called the fire department, according to the Rumford Falls Times. “They had small fishing poles and they were trying to fish. Almost a fatal mistake,” Rumford fire Chief Chris Reed told the Times. His friend, who was on another piece of ice closer to shore, made it safely to the bank by the time firefighters arrived, the Times reports. The teen was still stuck on an ice floe, which was spinning in the current, 50 yards from shore. Firefighters managed to guide the chunk of ice close to shore, where the boy was pulled to safety, the Times reports.